Five years ago, Evanescence was on the verge of living up to their name. After losing a founding band member and laboring over their second album, more personnel problems left the band’s future in limbo. A convincing performance Tuesday night at the Midland Theater by the hard-rock band left little doubt that it was still not only a force to be reckoned with, but very much here to stay. 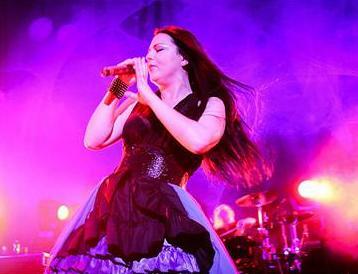 As the quartet relentlessly hammered heavy riffs, singer Amy Lee glided across the stage and sashayed over the cacophony, her voice simultaneously tempering and reinforcing the ferocity below. After roaring for nearly a half hour, Lee sat down behind a grand piano and dialed the music back a bit. Her near solo performances of “Lost in Paradise” and, later, “My Immortal” were spellbinding. When the band re-joined Lee, her piano provided the textured that made the performances even more intense. Even after Lee’s piano had been rolled offstage, her playing frequently appeared on the pre-recorded backing tape. Half of the 75-minute setlist was dedicated to the group’s self-titled third release, which came out last year. Although it was often difficult to hear the crowd over the band, the audience was definitely involved all night. Lee stopped to commend the room’s energy several times. When she invited her fans to join her singing they nearly overwhelmed her voice. The music was augmented by an impressive light show that sent rays throughout the room, bathed the stage in deep colors and punctuated every beat with a battery of strobes. A second bank of strobes above the stage revealed the band’s name behind a sheer backdrop. Evanescence hasn’t been a consistent presence on the charts, but when the band has regrouped enough to release singles they’ve tended to stick. Although the audience didn’t waver in enthusiasm for the new or older material, the half-dozen songs that appeared on the radio got especially boisterous responses. The Top 10 hit “Call Me When You’re Sober,” which Lee dedicated to all the ladies, generated an especially passionate sing-along. Setlist: What You Want, Going Under, The Other Side, Weight of the World, Made of Stone, Lost in Paradise, My Heart is Broken, Lithium, Sick, The Change, Call Me When You’re Sober > Imaginary, My Immortal. Encore: Swimming Home, Your Star, Bring Me To Life.